If we don't raise the debt limit, we know we would get mega-austerity and maybe a new financial crisis. But just how bad could it get? It's what Donald Rumsfeld would call a known unknown. We know that we don't know what would happen if we don't raise the debt ceiling before we run out of cash to pay all our bills on time. It might "only" crush consumer confidence, send markets cliff-diving, and slow down our already slow recovery -- if not push us back into recession. Or it might be a historic blunder that not only flattens the economy today, but also forever raises our borrowing costs and lowers our standard of living tomorrow. So the stakes are fairly high. We just don't know how high. And that, as my colleague Derek Thompson puts it, is the most terrifying thing of all. But there are a few things we do know. We do know what will determine whether this is a self-inflicted wound to the foot or to the head. That's whether we outright default on the debt or not. Remember, the debt ceiling doesn't stop us from borrowing more to pay for new spending. It stops us from borrowing more to pay for old spending. And it only stops us from borrowing more, because we say so. See, it's not that lenders don't want to lend to us anymore; after inflation, they're still paying us to borrow for 5 years. No, it's that we've said we won't borrow anymore, just because. It's a self-imposed limit. And if we don't lift that self-imposed limit, we enter a world of economic pain. 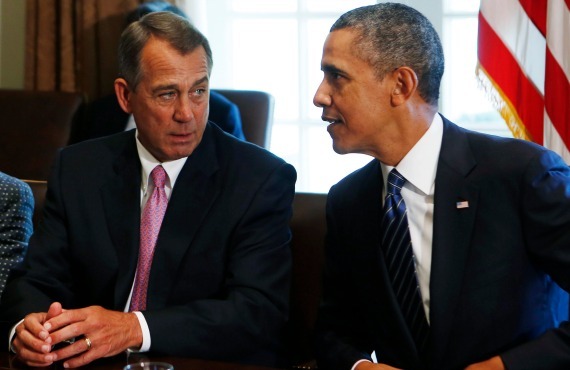 We couldn't borrow more to pay for the spending Congress has already authorized. We'd have to pay what we owe out of tax receipts and rolled-over debt instead. But as the Bipartisan Policy Center (BPC) points out, tax receipts and rolled-over debt would only cover 68 percent of our bills. So we'd have to cut the rest. This immediate 32 percent austerity could hit anything from Social Security checks to food stamps to the debt itself. Now, this last one is unlikely, but not impossible. How unlikely depends on whether the Treasury can prioritize its payments. Let's think about what would happen if it can and if it can't. Scenario #1: Treasury can prioritize the debt, so we get austerity but not default. Suppose the government doesn't pay its bills as they come due. Suppose instead it pays back the debt before anything else. In that case, interest rates wouldn't rise -- they'd fall. At least longer rates. 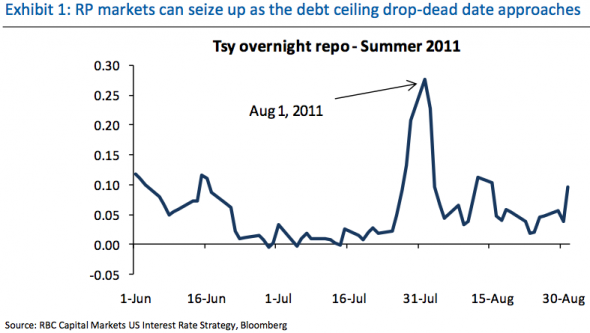 Now, short-term term rates on debt due to be paid back right after the debt ceiling hits would rise. But that's it. After all, investors flee to the safety of U.S. government debt (which pushes down rates) anytime things look grim. And cutting 32 percent of federal spending overnight would certainly make things look real grim real fast. Indeed, that much austerity would cost us millions of jobs at an annualized pace. If a debt ceiling showdown somehow lasted much more than a few days, the economy's heart palpitations would turn to cardiac arrest -- which, as long we were still paying the interest on it, would mean much more demand for our debt. It's paradoxical, but threatening to default on our debt might make investors want our debt more than ever. You know, as a safe haven. But this optimistic case isn't much of one. Even forgetting the austerity. For one, the spectacle of House Republicans once again debating whether or not to light the fuse on an economic bomb would be enough to crater consumer confidence. As Betsey Stevenson and Justin Wolfers point out, that's what happened the last time Republicans weren't so sure we should pay our bills back in 2011 -- and it took households awhile to get over their shock. For another, introducing any possibility of defaulting on the debt would be enough to make the financial system seize up. But wait. Isn't prioritizing payments supposed to mean we pay all the interest on the debt on time? Why would markets still worry about a default? Well, something might go wrong. And if it did, the financial system would not be in good shape. In fact, just the risk that it might is enough to make the financial system in not-so-good shape already. That's because our debt isn't just debt; it's money, too. Or at least close enough to money that we can say it's "money-like." Now let's translate that into English. All sorts of financial institutions fund their day-to-day operations with ultra-short-term borrowing. Repurchase agreements (or "repo") are the most common type. Here's how it works. A bank "sells" something for cash, but agrees to buy it back at the end of the day -- hence, repurchase -- for a little more than it got. So, for example, say a bank sells a Treasury bond for 95 cents on the dollar, and buys it back for 96 cents at the end of the day. Again, notice the difference between what it gets and what it pays for the collateral. That's the interest rate on what is really a secured loan. Okay, but what does this have to do with the debt ceiling? Well, the repo market isn't set up to tell if a Treasury bond has defaulted or not (because if Treasury bonds are defaulting, the world must be ending, right?). That means it only takes the hint of the possibility of a Treasury bond defaulting for the repo market to go into paroxysms. As you can see in the chart below, via Cardiff Garcia of FT Alphaville, that's exactly what happened during the last debt ceiling crisis in 2011: repo rates spiked when it looked like the debt ceiling wasn't going to be lifted in time. It'd obviously be worse if it actually wasn't lifted in time. In other words, interest rates would rise for financial institutions. And those financial institutions might not get as much help from the Fed as they need. The central bank's clearing system also isn't set up to tell if a Treasury bond has defaulted or not, so it could seize up too. And, of course, banks can't use defaulted Treasury bonds as collateral at the Fed. These are all very bad things. So, to sum up, if everything goes as well as it could, the recovery would only get a vicious knee-capping. There'd be the insane austerity. Interest rates would fall for the government, but rise for the financial system. And households would be scared for months, if not longer, about a political system exhibiting what my colleague James Fallows calls 1860s-style dysfunction. Scenario #2: Treasury can't prioritize the debt, and the world really ends. It sounds so easy to pay the debt back first. But prioritization is a legal and logistical nightmare. There's just little legal basis to justify paying some bills, and not others. Everyone we owe money to -- bondholders, military personnel, Social Security recipients, etc. -- has a good claim on whatever money we do have. Good luck getting whoever we stiff to go along with that. But even if we could legally choose who and who not to pay, we might not be able to do so technically. As BPC points out, the Treasury makes 100 million payments a month. It would have to reprogram its computers to pay the most essential ones first each day -- and it would have to do this fast. It's touching that Republicans so believe in the efficacy of government that they think the Treasury could pull this off without a hitch. But I'm not so sure. If it turns out the Treasury can't prioritize payments, then our world of economic pain will end very quickly -- because it will be the end of the world as we know it. Now, it's almost too awful to be worth contemplating, but let's give it a shot. There would be the same austerity. And an even worse collapse in consumer confidence. But instead of falling, interest rates would rise across the board as investors dump Treasuries that might default. The financial system might not have another Lehman moment, but then again maybe it would. At best, credit markets would freeze for awhile. But we haven't gotten to the worst part yet. The worst part comes after the crisis has passed. It's that interest rates wouldn't come back down to where they were before the crisis. Investors would decide that our 200-year long experiment with republican government had turned into one of the banana variety. In other words, they would decide to invest their money in countries that don't periodically threaten to default for no good reason. Interest rates would be forever higher than they would have otherwise been, and that would drag our standard of living forever lower than it would have otherwise been. That's some expensive political grandstanding. And it is grandstanding. Remember, the Republicans aren't threatening economic calamity, because they want to rein in spending. They're threatening economic calamity, because they want to stop poor and sick Americans from getting health insurance. That is, they want to stop Obamacare. But that obviously isn't happening as long as someone named Obama is living in the White House. The Republicans had their chance to make sure someone named Obama wasn't living in the White House in 2012, and they did not succeed. Throwing a temper tantrum won't change that, even if that temper tantrum involves holding the world economy hostage. Now can we please leave the hostage alone? Matthew O'Brien is a former senior associate editor at The Atlantic.